Calvin Mackie is one of the nation’s most prolific young STEM and educational motivational speakers and leaders. He is an award-winning mentor, an internationally renowned motivational speaker and a successful entrepreneur. His message as a mentor, speaker, entrepreneur and former engineering professor continues to transcend race, gender, ethnicity, religion, and time. 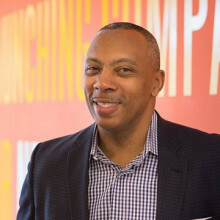 He is the founder and CEO of STEM NOLA, a nonprofit organization that grows future innovators, creators and entrepreneurs through inspiration, engagement and exposure in the fields of science, technology, engineering and math (STEM). In a time where nonprofits are ever seeking new grants and other funding opportunities, STEM NOLA has created a revenue-generating model through services and products that fuels its programs and operational budget.